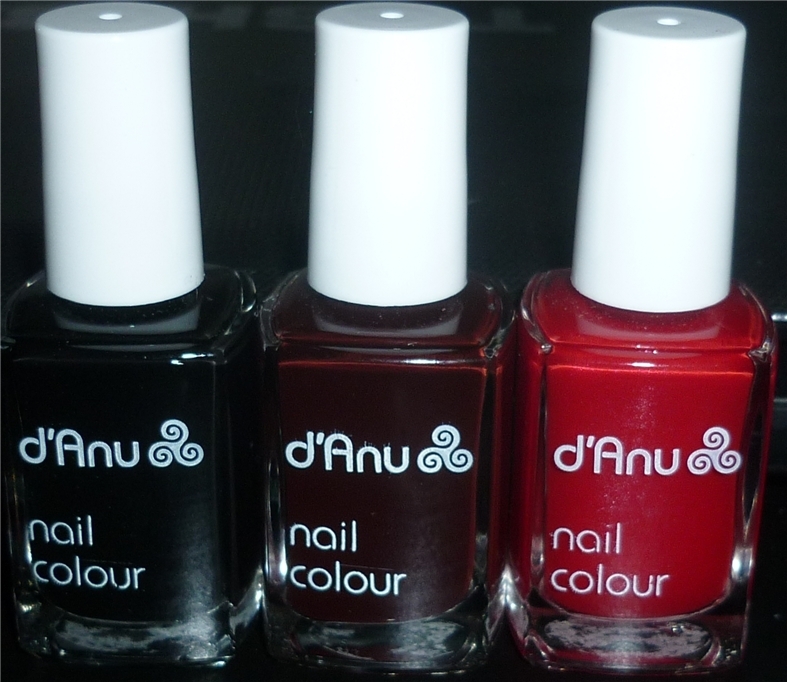 d'Anu is a natural luxury cosmetic brand with products such as skincare, haircare and of course nail colours. They have their own web store which you can shop here. All of their products are made in England. I was kindly sent three of their nail polishes to review. The packaging is very basic and bland, which to be honest isn't attractive. The brush is on the thin side but is very precise. I know some people have a preference in brush type I'm personally not fussy. However the formula is excellent, it has a thin consistency but it doesn't seem to affect the pigment. You wouldn't get any gloopyness from these polishes whatsoever. I prefer a thinner nail polish consistency as it's much easier to do your coats without the polish getting too thick. Drying time is pretty average but I couldn't care less as I use Seche Vite over everything. The wear time is really descent, usually I find I chip in one day as I use my hands a lot and I'm clumsy too. I wore the shade Harlot 3 days straight and it only had little wear to the edges without any chips. So I'm very pleased! Yes my swatches are a little messy. I thought I applied them neat till I took the picture. My camera picks up everything. All of these are swatched without any topcoat. 3:00 AM- Creamy glossy black. I get a deep black with 2 coats. I hate it when blacks come out grey and streaky and I'm pleased to say this doesn't. Jet Setter- Is a jelly blackened red wine colour. These are my favourite type of shades. I have to say this is my favourite black red I own so far. I can get different looks in the 3 different stages of coats I apply. With one coat you get a more light red wine shade and the more you apply the deeper and bloodier the colour gets. Harlot- Is a gorgeous pink red, it has micro shimmers that are pink and catch the light. This one is the sheerest out of the bunch as it's more of a jelly type. This can be easily sorted out with 2-3 coats. Depending on how heavy handed you are with your polish. Overall I'm really happy with these polishes, just the packaging isn't that attractive in my books. Disclaimer- These samples were sent to me by PR for review purposes, this does never mean I will give a false review. All my reviews are always my total honest opinions. Really pretty colors, I like Jet Setter the most.